A BIG THANK YOU TO CSVW TRAIL VOLUNTEERS! CSVW would like to extend a HUGE THANK YOU! to the many volunteers who recently answered the call for help grooming the trails! The CSVW Trails are absolutely beautiful and the perfect place to spend a day this winter! Freshly painted trail blazes lead the way to stunning natural scenery that offers hours of fun in the great outdoors! Visit us during School Vacation Week! PLEASE sign in at the kiosk and leave us your comments! 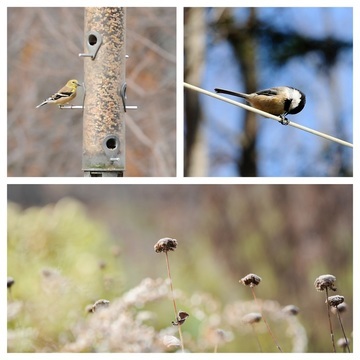 THE GREAT BACKYARD BIRD COUNT IS THIS WEEKEND! This is a great winter activity that is fun for all ages! A terrific learning opportunity that is beneficial to the birds! THE FOLLOWING INFORMATION IS FROM the GBBC WEBSITE …. 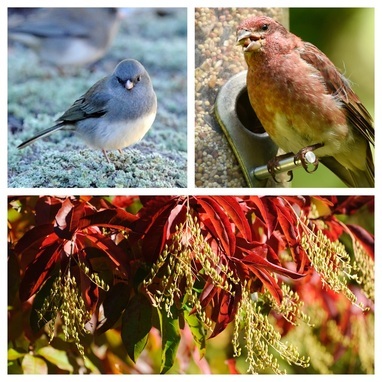 "Launched in 1998 by the Cornell Lab of Ornithology and National Audubon Society, the Great Backyard Bird Count was the first online citizen-science project to collect data on wild birds and to display results in near real-time. Scientists and bird enthusiasts can learn a lot by knowing where the birds are. Bird populations are dynamic; they are constantly in flux. No single scientist or team of scientists could hope to document and understand the complex distribution and movements of so many species in such a short time." If you participate in the GBBC let us know your results - AFTER YOU SUBMIT THEM TO THE GBBC OF COURSE! ​We would love to hear all about your observations! Good luck with your counts and HAPPY BIRDING! LOOKING FOR MORE FUN IN THE SNOW? Visit the CSVW Winter Trails this weekend! CSVW Trails have been broken open by snowmobile and debris removed! (exception: Tappan & River Trails) Trails will be packed and groomed as soon as mother nature delivers more snow. Today there is about 1” of snow on a hard surface making skiing conditions fast but not a very soft landing if one falls . There are plenty of animal tracks to investigate and it is a beautiful day! Great day to be outside at CSVW! 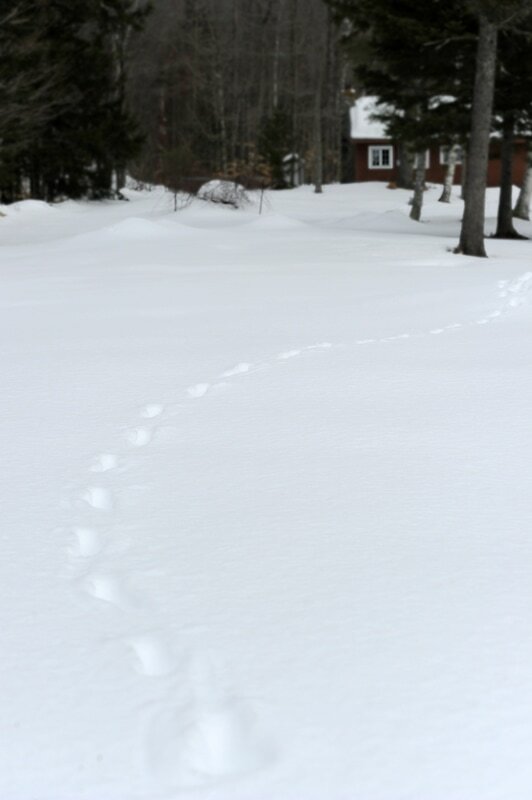 ​TRACKS ON THE TRAILS IN THE WINTER WONDERLAND AT CSVW! Come see what animal tracks you can find! 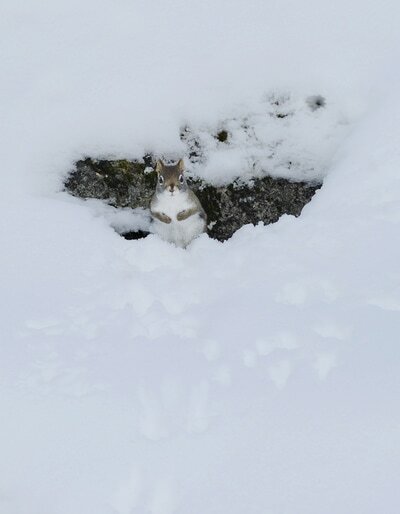 It is great exercise and an excellent opportunity to learn lessons about the wildlife activity visible in the snow! 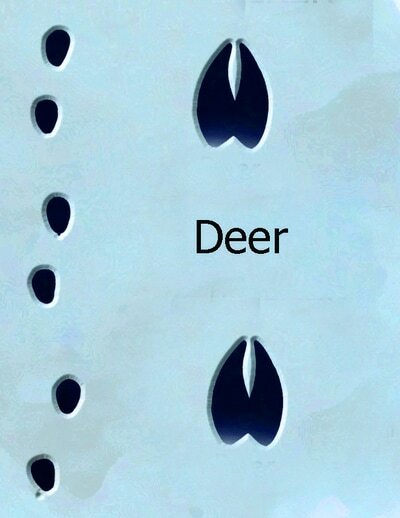 Did you know that when deer walk they leave tracks that make them appear to be a 2-legged animal? In the deep snow this energy-conserving method of walking involves stepping the hind foot into the track already made by the front foot. While deer are considered “Walkers", squirrels and hares are considered “Gallopers” or “Hoppers”. 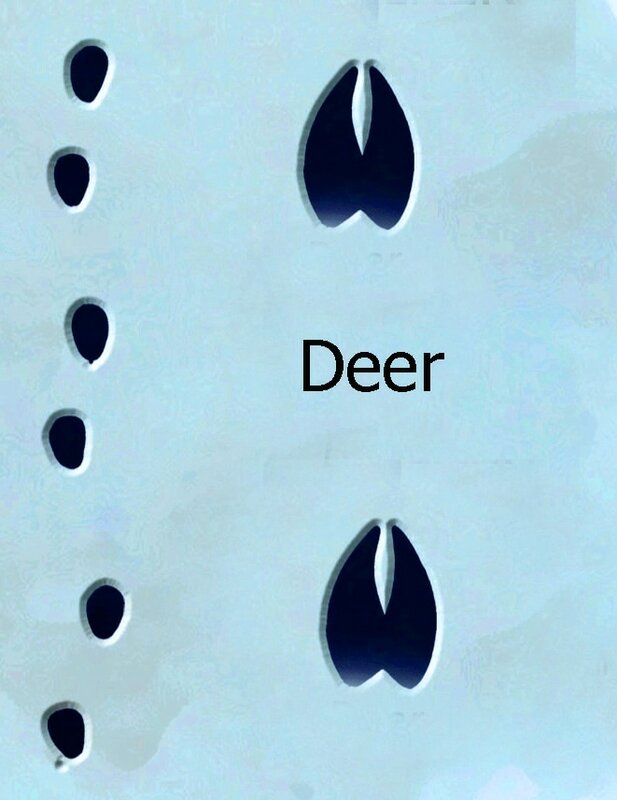 In this case the hind-foot prints are actually the forward and larger prints in the track with the smaller front feet slightly behind those. 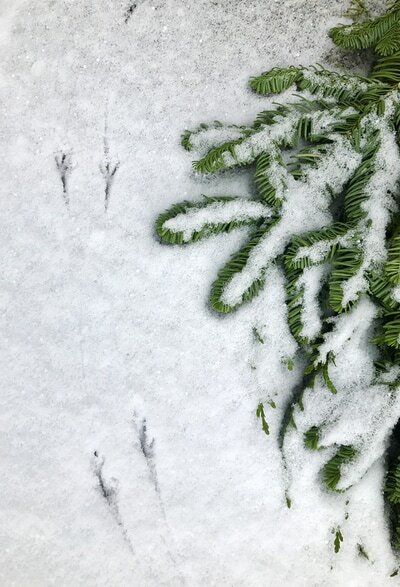 If you find tracks that are running from tree to tree, you can be pretty sure they are that of a red or grey squirrel. You might also find footprints of fox, coyote and moose on the CSVW Trails. Maybe even a bobcat! All of these wildlife creatures live in the area of the Chapman Sanctuary and are active in the winter. Come on XC-skis or snowshoes or come on foot! 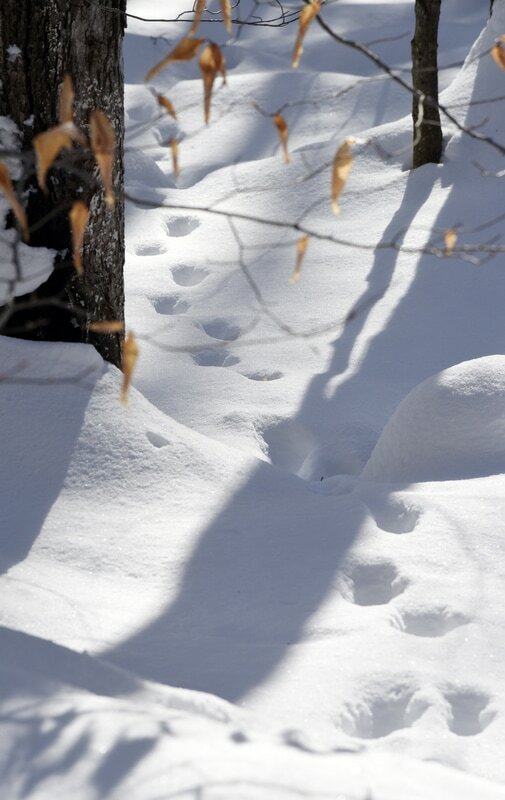 Be observant and you will find many kinds of animal tracks as you enjoy the CSVW Winter Trails! Please sign in at the Kiosk! Leave your comments and observations for us. We’d love to know what you saw on the CSVW Trails! ​Visit our Facebook, Twitter and Instagram pages (links top of page). The 22nd Annual Sandwich Christmas Bird Count Results are IN! 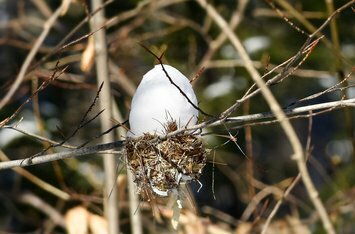 The 22-year old Sandwich, New Hampshire Annual Christmas Bird Count was started by Margaret and Jim Vernon of North Sandwich. Tony Vozzano has compiled the tallies and information for nearly 15 years now. On January 2, 2017 the weather was ideal for the annual count with seasonable temperatures, sunshine and light wind. 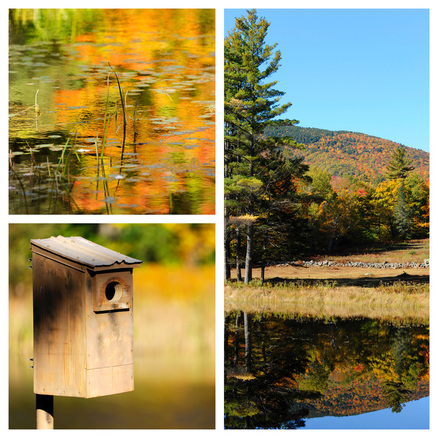 The total of 43 species of birds is close to Sandwich, NH's long-term average as is the 2737 number of individual birds. With hardly any open water at the time of the count, it is not surprising that waterfowl numbers were down considerably from the past couple of counts. 5 Common Redpolls, and 1 Pine Siskin were seen. The 6 Barred Owls ties the record from 11 years back. Sandwich, NH residents who participated! These Sandwich, NH numbers will be added to Audubon's Society's Annual BIrd Count. Black-throated Green Warbler who is now basking in the southern tropical sunshine? 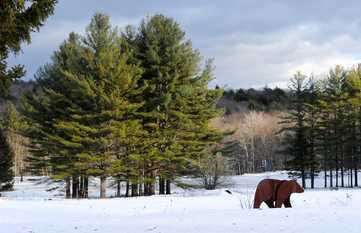 ​CSVW WINTER TRAILS are a wonderful place to get outside, explore and make discoveries! 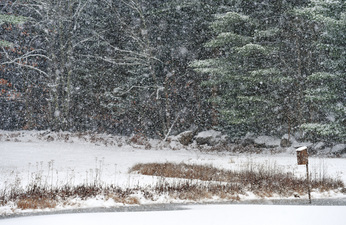 As if CSVW wasn't wonderfully wintery enough ... MORE SNOW is on the way! Get your XC Skis or Snow Shoes or Snow Boots and GET HERE!! It is always a beautiful day at CSVW. HAVE A GREAT DAY OUTSIDE AT CSVW! WELCOME WINTER by remembering your feathered friends! provide shelter in the form of a bird box - a pile of branches, leaves & twigs works too! The birds will come and they will bring you their beauty in exchange for these gifts! Please consider donating to CSVW at this time of year to help provide extra nutrition for all the birds that make the sanctuary their year-round residence! Visit our Contributions Page on this website! CSVW IS EVERY WHERE!! And now you can keep up with what is new and happening at CSVW where ever you are ! Grab your Cross Country Skis and HIT THE CSVW TRAILS! Cold River - it is a snow shoe only trail. CSVW has so many options to get outside in nature and enjoy yourself in the clean, cold New Hamphsire winter! Come experience the unique peace of a snow-covered forest. Take a mindful pace and listen to the sounds of winter in the woods. Be still. Observe. 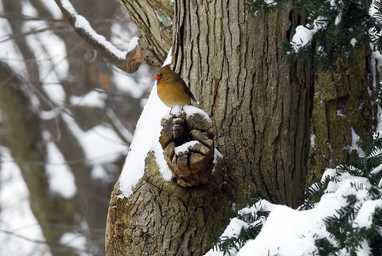 There is something for everyone this winter at Chapman Sanctuary and Visny Woods. RIGHT NOW is a great time to walk the trails and discover nature as it transitions into winter mode. With the trees and underbrush bare there is so much to see that was hidden under summer growth! Woodland animals are still very busy gathering and storing food for the winter and the feeders are always a birdwatcher's delight with a wide variety of birds who take advantage of that food source. CSVW Trails are loaded with classic stonewalls, stone mounds and boulders that are used by wildlife for food-storage and shelter. Downed trees and brush piles also provide a safe and natural habitat for countless species of forest creatures. All these things and more are revealed this time of the year! As always CSVW requires that visitors leave the trails as they find them and that guests do not disturb or remove any stones or any other material as this may directly and adversely impact the animals and birds. Come to CSVW this weekend and discover something new! PLUS! Start mapping out your Cross Country Ski day on the CSVW Trails this coming winter! A male and female pair of Hooded Mergansers were on Teacup Lake again. It is possible that the female may have chosen her male as there was only one male present at this time. The two ducks fished and paddled around leisurely together for a long time in the early evening hours staying close to each other. A River Otter glided across the surface of the water without disturbing the ducks. It disappeared underwater and into the tall grass along the edge of Teacup Lake. 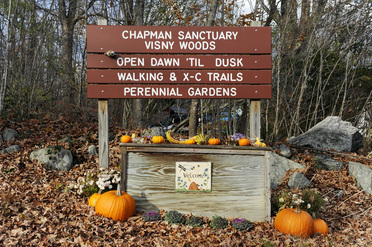 Come to Chapman Sanctuary/Visny Woods and spend a beautiful day on the CSVW Trails and at Teacup Lake. You might catch a glimpse of these beautiful animals in their pristine natural habitat. Please sign in at the kiosk at the Chapman House. Tea Cup Lake just as the sun was setting. The males were sizing each other up and displaying their crests in the presence of the female. Hooded Mergansers often form pairs in late fall / early winter. Goldfinches remain in New Hampshire through the winter months and may be present at available food sources such as those provided by the CSVW feeders. You might not immediately recognize them since the males lose their bright yellow color and become more brown and sparrow-like in appearance. Black-capped Chickadees often hold seeds and berries between their feet to crack open or break into smaller bits. has been set for November 12, 2016. Dark-eyed Juncos make their appearance in New England in autumn and winter months and they certainly have arrived at CSVW in strong numbers. Juncos are a medium sized, ground sparrow who feed on seeds, small fruit and berries. Black-capped Chickadees are popular little birds who are well-known in the area. Their curiosity and acrobatics make them experts at finding and utilizing feeders. CSVW offers plenty of food options for the Dark-eyed Junco, Black-capped Chickadees and other species that winter in New Hampshire. The colors keep unfolding at Chapman Sanctuary and Visny Woods! Oxydendrum or Sourwood (a Lily of the Valley-like tree) located near the Perennial Gardens have turned a rich dark red adding to the color palette that changes almost daily. A trip to CSVW is a must this fall season! ​Please sign in at the Kiosk where trail maps are available. Autumn has splashed itself all over Chapman Sanctuary and Visny Woods! Tea Cup Lake and the CSVW Walking Trails are absolutely resplendent! If you are in the Sandwich, NH area do come and allow yourself some precious time in as peaceful and pretty a setting as it gets. If you are not in the Sandwich, NH area .... get here! Spend the day out on the trails with your binoculars or camera. Nature will not disappoint you. Send us YOUR favorite CSVW photos to ChapmanSanctuary@gmail.com we would love to see them! 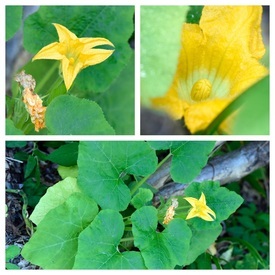 The plant found on September 28 has grown enough to be identified as a squash. and let us know what you find! Please remember to sign in at the Kiosk. 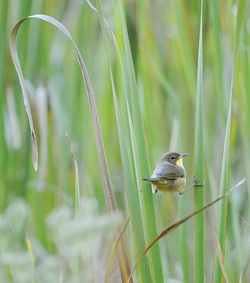 A female Common Yellowthroat was seen in the grassy areas around Tea Cup Lake. Common Yellowthroats, who have made CSVW their home this summer, feed on insects low to the ground in thickets and fields such as those provided by The Chapman Sanctuary and Visny Woods. Soon these birds will migrate to warmer climates, but for now their food source is still available. You still have time to come to CSVW and view the Common Yellowthroat in it's natural habitat! CSVW is home to countless species of migratory birds as well as year-round residents who depend on the healthy environment at the sanctuary. 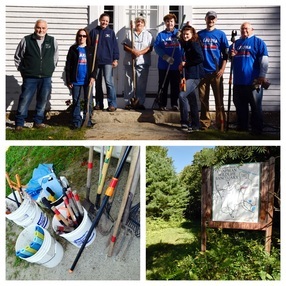 On Friday, September 16th The United Way sent a team of volunteers from NHEC to CSVW as part of the United Way's Day of Caring yearly event. The group performed some very important maintenance on the trails, in the gardens and all over the Sanctuary grounds. CSVW Wildlife depends on the protected environment provided by CSVW and it is imperative to keep trails open, clear of brush and passable. The gardens need weeding and edging in order to continue to flourish for the animals and especially the pollinators that are so critical to all of us. ​A BIG THANK YOU! To the volunteers that participated in the United Way Day of Caring! There are many ways to help while you enjoy the beauty of the sanctuary! A Yellow Bellied Sap Sucker hammered away at a tree in the brilliant sunshine behind the Chapman House while a Red Breasted Nut Hatch took to the feeders. 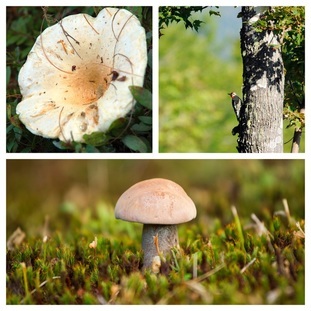 MUSHROOMS are emerging in all shapes and sizes all throughout the forest and the creatures that eat them leave evidence as pock marks and discarded bits of stems and caps. Labor Day Weekend is here! 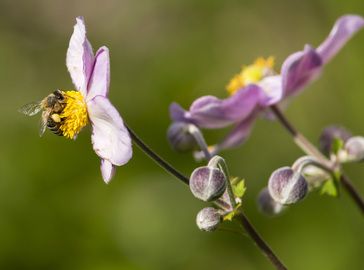 Aptly named for the many species of bees in and around CSVW who labor tirelessly day in and day out collecting pollen from the flowers that still surround Tea Cup Lake and in the Sanctuary Gardens. ​Summer may be winding down but there is always something buzzing at The Sanctuary! The summer months have seen many days with temperatures climbing into the 90s but that doesn't keep nature from carrying on! The CSVW feeders are as populated as ever and there is always something new blooming. Turk's Cap Lilly in the sanctuary gardens have remarkably vivid colors. 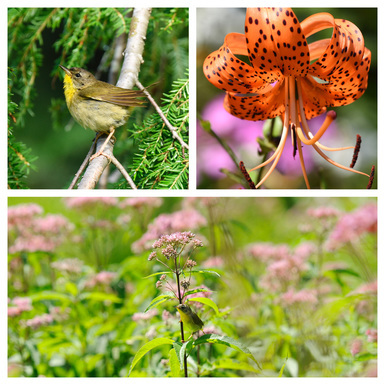 Teacup Lake is all decorated with yellow Golden Rod and pink Milkweed and the birds, butterflies and other pollinators move happily from bloom to bloom all day. and dragonflies fly and land everywhere. Plenty of summer left to come see all of this magic! The Bird Feeders behind the Chapman House are always busy! So many beautiful and colorful birds come to visit the feeders and take advantage of the nourishment offered every day! The female Grossbeak is so pretty she does not need the red-breast of her male counterpart to be stunning! 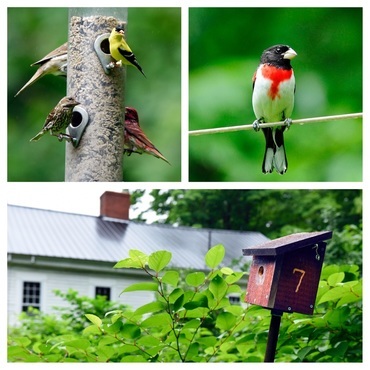 Drop in and observe the birds coming and going all day long ~ it is a show not to be missed! Please sign in at the Kiosk. CSVW Wildlife Sighting photos on Wildlife Habitat Management Page. Sarah Zuccarelli led a very informative tour of The Chapman House grounds and the gardens beside Tea Cup Lake on July 9, 2016. 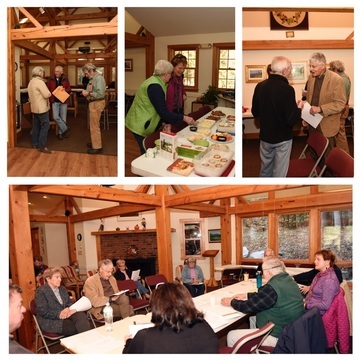 A group of 7 members and visitors enjoyed the remarkable beauty that CSVW has to offer and learned the names and care techniques of countless varieties of perennials and other plant life. There is always something blooming anew! Photos on Calendar Page. A beautiful Indigo Bunting has been spotted in the field near Tea Cup Lake near the bat box. A male Common Yellow Throat was flitting around in the bushes surrounding Tea Cup lake while 2 female Wood Ducks paddled leisurely. 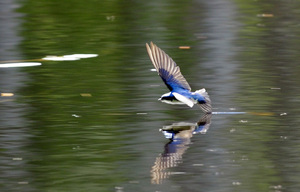 Tree Swallows were busy as ever diving and scooping up bugs from the surface of the water and catching flying insects in midair! A fisher was seen at CS/VW early on Saturday morning. Remaining bushes were planted by volunteers at CS/VW. has been set for November 12, 2016. Details on Calendar page. Female Wood Duck with 4 DUCKLINGS! ​A large, graceful Great Blue Heron has been seen searching for his dinner at Tea Cup Lake. BIRD WALK led by Christine Costello began bright and early at CS/VW. Many species took advantage of their forest habitat and remained unseen but certainly not unheard. Participants of the walk learned how to identify birds by their songs and calls and became so familiar with some varieties that they could easily recognize the birdsong by the end of the event. The group was also educated on the nesting and breeding habits as well as preferred food sources of the CS/VW resident birds. Photos on Calendar Events page. WOODLANDS WILDFLOWER WALK led by Sarah Zuccarreli was a great success and well attended despite temperatures climbing into the 90s! Many plant and flower species were located and identified. Participants of the walk learned the environmental importance of the varieties of plant life at CS/VW as well as their preferred areas in which to grow. Bloom and fruit bearing times were discussed in addition to which woodland creatures may use the different types of vegetation as a food source. Photos on Calendar Events page. A family of bears has been spotted at CS/VW! A sow and 3 cubs has been seen and also a male. There have been 2 sightings of a Red Fox near Tea Cup Lake! Likely the fox is denned up with her young somewhere in the area. WILDFLOWER GARDEN AT TEA CUP LAKE! A 1/2 acre has been plowed and harrowed for a new Wildflower Garden at Tea Cup Lake! The field had not been plowed for many years if ever and the root mass was thick. It will take many more times with the disc harrow before a rototiller can be used on the site. The female Merganser was on Tea Cup Lake this morning at 8:20am. In previous years, the nesting female came out onto the water twice a day, between 8:00-9:00am and again approximately 3:00-5:00pm. A Kingfisher flew from tree to tree in higher branches around the perimeter of Teacup Lake. The Male Hooded Merganser was on the move and seemed to stay close to the Duck Box. The turtles were piled up on the shore sunning themselves and taking in the view! The Canada geese were well-hidden but then emerged from a grassy area and paddled around together on the open water. CS/VW and it's inhabitants can always use a helping hand. Email us at ChapmanSanctuary@gmail.com or use the form on the Contact Us page to let us know how you or your group would like to help. It's a fun way to get out in the great outdoors and do some good for the Sandwich Wildlife! The Moultonborough Boy Scouts recently volunteered to clean out all the bird boxes in the Sanctuary in preparation for Spring nesting. The troop had a lot of fun while earning their Community Service Badge and learning about the birds and wildlife that will benefit from their efforts! Check out the fun they had in the slide show on the Calendar Page. 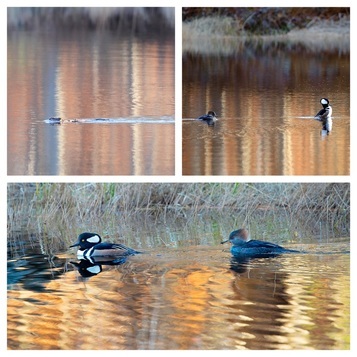 TWO pair of Hooded Mergansers and 1 pair of Mallards spotted on Teacup Lake today! Will we see ducklings from any of these pairings? Check the calendar to find out. Our first visitors of the season to Teacup Lake have arrived! Ice is out, and we have a pair of mallards PLUS one male hooded merganser and four females. The following committees were established at the CS/VW Annual Meeting, Membership; Publicity / technology; Fundraising; Wounded Warriors; Nominating; and Volunteer Recruitment. on the MORE page, send a note to us at PO Box 96, Sandwich,NH 03227, or talk to a Trustee. The logging yard for the last thinning as part of our Wildlife Habitat Improvement Plan will be located to the west of the entrance to CS/VW with access on Mt. Israel Rd. After the thinning is completed (early spring) the entrance to the logging yard and the yard itself will be upgraded to be the new parking area for visitors. We hope to have this completed by mid summer. This year CSVW has undertaken a membership drive, our goal is to make as many people as possible aware of the Chapman Sanctuary / Visny Woods. During the year we will offer talks on topics related to wildlife and wildlife habitat,free admission for members. We will also be scheduling days for putting up Hawk, Bat,and bird boxes, an opportunity for hands on experience or a chance to volunteer help.